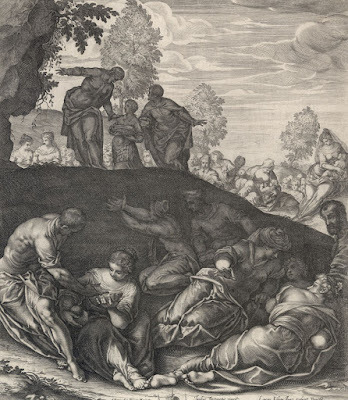 “The Miracle of the Loaves and the Fishes” (aka “Die wundersame Brotvermehrung”; “Multiplication of Bread and Fishes”), 1602 (as inscribed on the plate “M.DCII”), after the painting (1578–81) by Jacopo Tintoretto (1518–94) in the Scuola Grande di San Rocco (Sala Superiore) in Venice, published by Pierre Mariette (1596–1657). 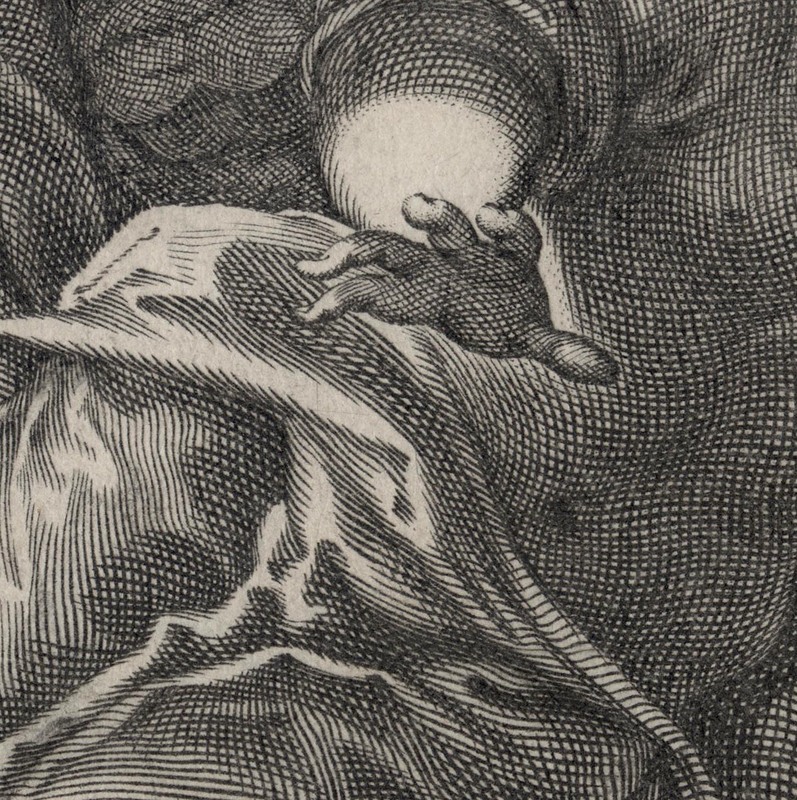 Engraving and etching on laid paper with small margins backed with a support sheet. Lettered on plate below the image borderline in five lines with a coat of arms breaking the text at the centre of each line: “BIS DVO PAVISTI QVONDAM QVI MILLIA, SEPTEM […] ET TVA NVNC POTIS EST PAVCIS BENEDICERE, MVLTOS / PANIBVS, ÆTHERII CHRISTE PROPAGO PATRIS: […] VT SATIENT, POTIS ET DEXTERA SEMPER ERIT. / REVERENDISS.mo ET ILL.mo PRINCIPI. DÑO. D. WOLFGAN: […] GO EPISCOPO RATISPONENSI PRÆPOSITO ELVA. / CENSI DÑO SVO. OMNI OBSERVANCIA COLEN: […] DISS. DOMINICVS CVSTOS AVG. VIND. DDdt. / AÑ. P.C.N. […] M.DCII." 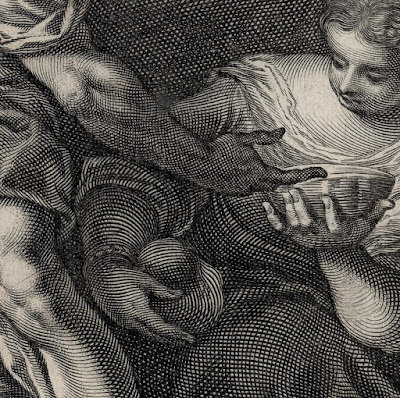 See also Anette Michels in J.R.Paas (ed.) 2001, “Augsburg, die Bilderfabrik Europas”, Augsburg, pp. 41–54. 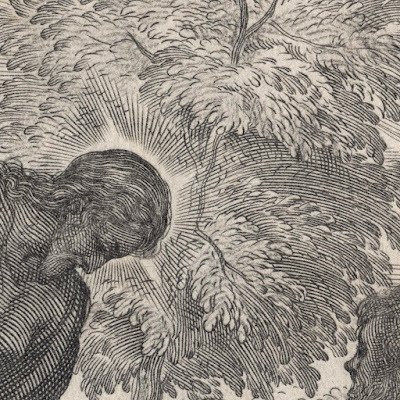 Condition: crisp, well-inked and well-printed impression with small margins (approx. 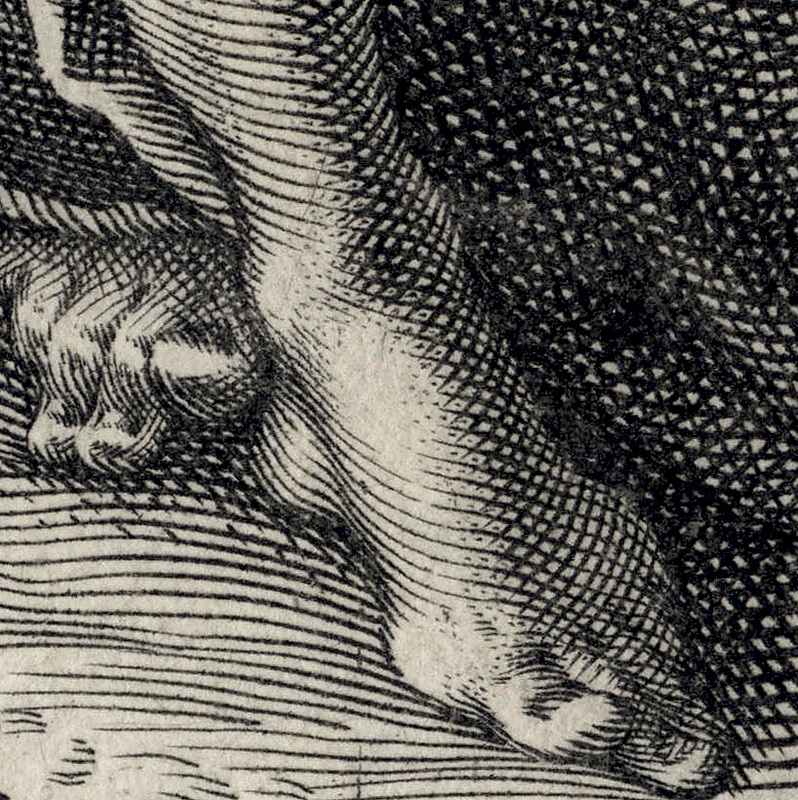 1 cm) in very good condition for the age of the print (i.e. there is a closed tear on the right edge of the sheet and minor abrasions otherwise there are no significant holes, folds, stains or foxing). The sheet is backed with archival (millennium quality) washi paper. 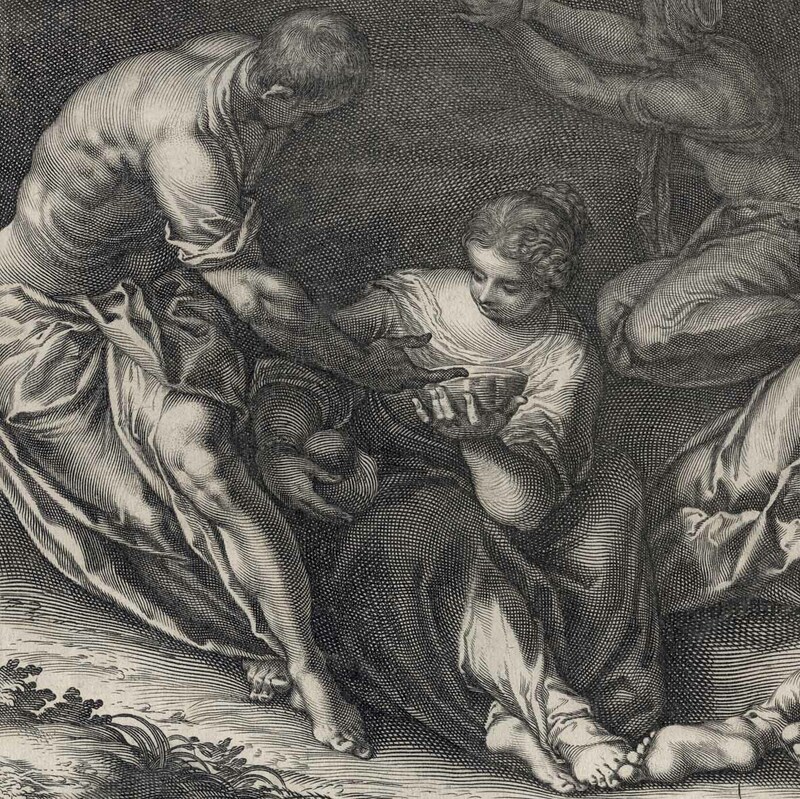 I am selling this exceptionally rare, large and superbly executed engraving for the total cost of AU$323 (currently US$243.76/EUR204/GBP180) including postage and handling to anywhere in the world. If you are interested in purchasing this important print that has been professionally cleaned and backed with a support sheet, please contact me (oz_jim@printsandprinciples.com) and I will send you a PayPal invoice to make the payment easy. 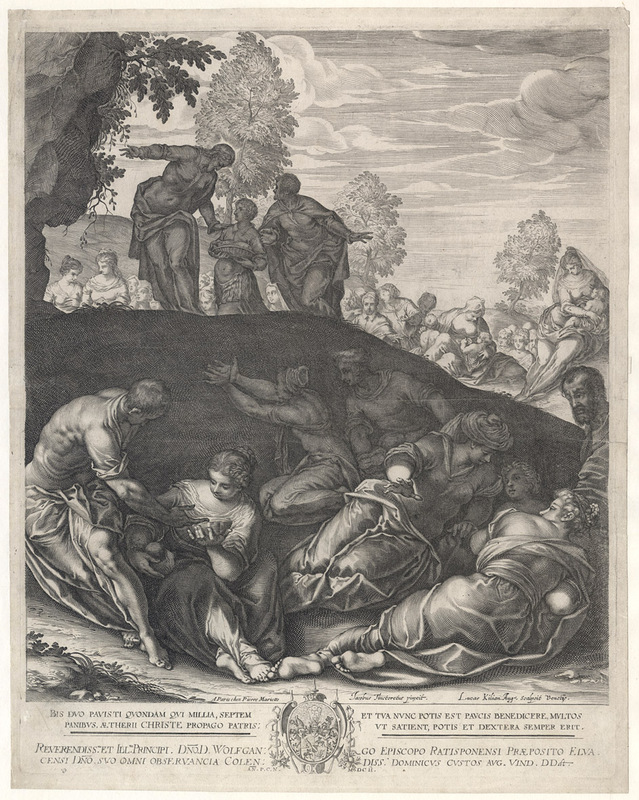 This evening when I was comparing Tintoretto’s painting with Kilian’s translation of it into this line engraving, I remembered reading about a sign that Tintoretto is purported to have had in his studio: “Il disegno di Michelangelo ed il colorito di Tiziano” ("Michelangelo's design and Titian's colour"). 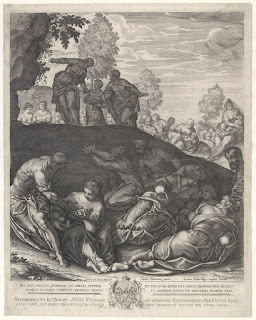 Mindful of Tintoretto’s esteem for Michelangelo, I was surprised that Kilian’s engraving seemed to have more of Michelangelo in it than I could see in Tintoretto’s painting. For example, note how the two figures in the lower left foreground of the engraving are rendered with a flow of rhythms that actively invite the eye to move around them. By contrast, when I look at the same figures in Tintoretto’s painting, I do not see the same Michelangeloesque conception of three-dimensional voluminous space. 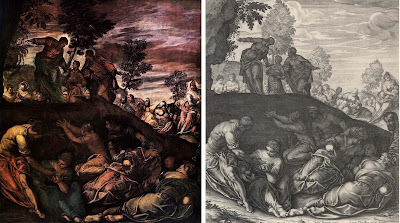 Instead, Tintoretto’s figures appear somewhat flattened in this comparison. In terms of compositional design, I believe that Killian has again captured more of Michelangelo’s understanding of design than Tintoretto has been able to express in his painting. 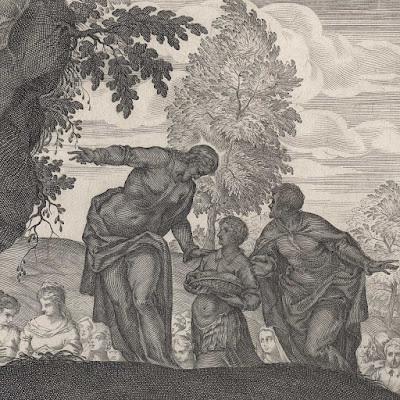 For example, note how Kilian has clarified the pivotally important line of separation in the composition between the dark foreground and the light background. 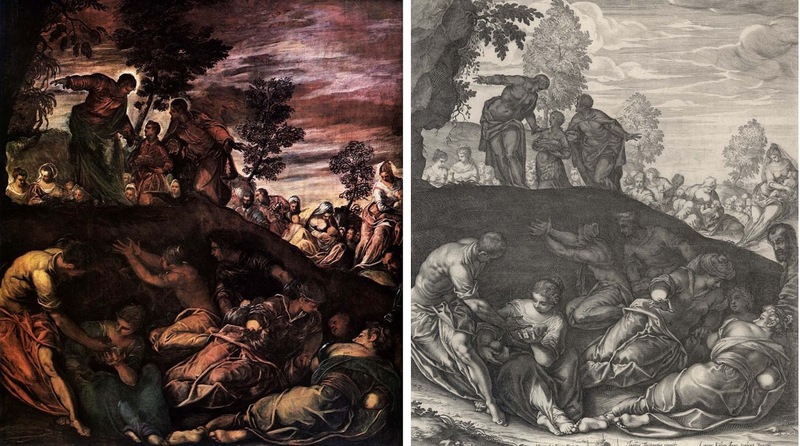 By contrast, Tintoretto still has the same division separating both spatial zones but, to my eyes, Tintoretto “muddies” the tonal juxtaposition by introducing his love of Mannerist light spots within the dark zone and dark silhouette shapes of trees within the light zones. In short, what I am proposing—and I may be very wrong—is that in the case of Kilian’s translation of Tintoretto’s painting into an engraving, Kilian may have captured the strength of design that Tintoretto professed to seek.